People carrying the dead body of Javaid Ahmad. On October 21, 2018, at around 10:30 am, after the killing of three local militants by a mixed contingent of police, CRPF and the army during wee hours, anguished people from Laroo and adjoining villages of Kulgam rushed towards the encounter site. It happened moments after the army and firefighters left the area. Apparently desperate to see the spot, the people passed through a narrow street with mud-brick houses and crossed a small stream to reach the site in Laroo’s Bounpora. Surcharged and raising pro-freedom slogans, few young boys entered the smouldering house of Sheeraz Ahmad Bhat. Quite a few though stayed outside the premises. Within a few minutes, an ear-splitting bang and a sweeping cloud of thick black smoke engulfed everything. It eventually ended with the killing of seven youth which pushed the entire belt into mass mourning. Two days later, visibly distraught, Sheeraz Ahmad Bhat, sifts through the ash and debris where his home once stood, looking for some remains. On one pile of rubble lies an old cloth, on which people generously donate money out of their own will. Visitors throng to the encounter site, take pictures of the scary scene and drop some money as a contribution for rebuilding the devastated life. Few doors away, Hafizullah Bhat, a labourer, sits on the window of his two-storey mud-brick house waiting for his dead son’s return. His longing eyes are glued at the main gate of his house. Muqeem was a class twelfth student and was going to write his first paper on Monday. In his tenth class examination, he had scored a distinction. His younger brother is in ninth class and sister in the fifth primary. The family is ruing over their fate that their ward became the reason for the cancellation of the examination for all the students across Kashmir. Muqeem’s younger brother, Adnan, while showing his recent date sheet recalls his mocking behaviour. Muqeem had replaced the word date by tension, referring to it as ‘tension sheet’. But his room presents a different view altogether. In his room is a little steel trunk, full of religious books like Seerat-e-Mustafa and Muhammad-e-Arabi. One of the walls of his room is full of graffiti with pro-freedom slogans. In the corner of the wall he has mentioned some dates, like July 8, 2016, and May 27, 2017; these are the dates when Burhan Wani and Sabzar Bhat, both Hizb commanders, were killed, respectively. On the other end of Laroo, in the plywood room of Talib Maqbool Laway that he had erected on the top of his single-storey modest house, his bag and books still lie open on his study desk, along with his eyeglasses and a wristwatch. Few minutes after Muqeem’s death, Talib was brought to the same hospital, where he was declared dead within minutes of his arrival. Unlike Muqeem, Talib had to appear in his last paper of BA first semester, just 24 hours after his death. Having lost his father, when he was just two, Talib used to work in neighbouring fields to fund his studies. Talib’s mother, Naseema Akhter, who was unaware of her son’s death till his dead body reached home, is inconsolable and repeatedly calling him: “Who will take care of your mother and sister now.” She has just one story to share with all the people coming to console her. The previous night when the guns were roaring, she took her son and kept him in her room. “In the morning everybody went to the encounter site, so did him,” she says. “I regret leaving him alone.” Naseema is now being taken care of by her daughter, Sumaira, who had to drop out of school because of poverty. Shurath is not far away from Laroo. This hamlet has not seen any stone pelting or a casualty in the last 17 years. In the centre of the village, a few young men are busy fixing green banner on the roadside. At the centre of one banner is painted Shaheed Padder Irshad in bold Urdu letters, a photograph of the slain pasted just above it and a line, which according to his friend, best sums up Irshad’s fate: Khwab, Tamana, Yakeen, Jawani ki Dehleez, Aur phir Jam-e-Shahadat (Dream, Longing, Belief, the onset of youth and then martyrdom). 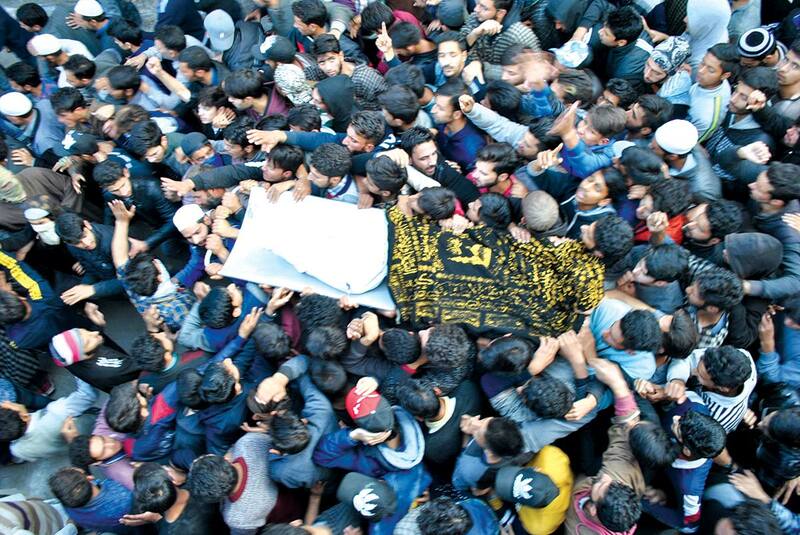 On the fateful Sunday morning, Irshad Padder son of Syedullah Padder, a recent graduate from degree college Kulgam left his home along with his brother Waheed Ahmad Padeer, also his batch mate, to join the funeral of the slain militants. But destiny had other plans. Sports lover Irshad had many medals to his credit, with cricket and volleyball being his favourite. Hugging his cricket uniform and kissing his medals, Waheed is in a state of deep shock and isolation. Irshad had two brothers and three sisters, of whom the elder brother is a sub-inspector in Jammu and Kashmir Police. His father, Syedullah Padder, a labourer, says Irshad was injured at the encounter site but when he was taken to the district hospital, doctors declared him ‘brought dead.’ Irshad had four funeral prayers. The Sunday mayhem, unprecedented in the belt, created a situation that the road connecting Kulgam with Anantnag witnesses shattered families and mourners after every one or two villages. 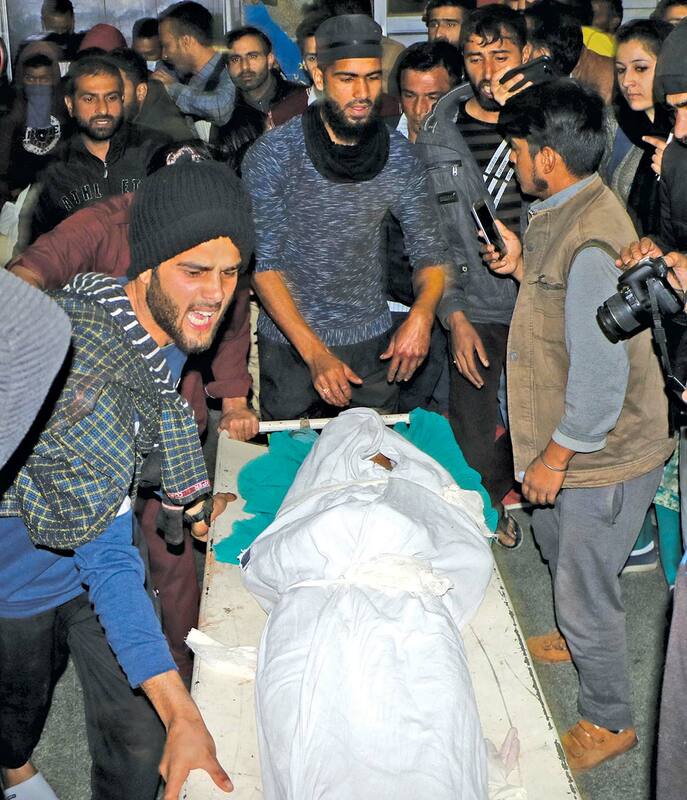 On blood-soaked Sunday noon, at around 12:30 pm, a pall of gloom descended on Danew Bogund, when Dars’ received the corpse of Mansoor Ahmad Dar, 29, their son. In the morning, Dar had left home to visit the encounter site where he was seriously injured and succumbed to his injuries later. “His body was drenched in blood with splinters of the explosives all over him,” says Naseer Ahmad, one of his relatives. More than 24 hours after burying his son, Ghulam Mohammad Dar sits on the porch of his well-built one storey house, surrounded by a cluster. Ghulam rarely moves around and is bed-ridden since he met a car accident a year ago. He requires the help of at least one person to move from one place to other. For Ghulam Mohammad, the grief over the death of his son has turned into anger. As his relatives urged him to speak about his son, the 50-year-old is reluctant. “What good will happen if I talk about my beloved son? Will it bring him back? How can one explain the pain of losing his lone son,” he shouts. Apart from aged parents, Mansoor is survived by an unmarried sister, wife and a toddler son. He was a post-graduate in history and was working as a cable operator in Devsar. Mansoor was the lone breadwinner of the family of five. His mourning friends still recall the days when Mansoor scored distinctions in the class tenth and twelfth and was a celebrated topper in the whole area. Just a few graves away from Aquib’s grave is that of his mother, who died in 2006 when Aquib was barely 8-years old. Two years after the death of his mother, Aquib’s father remarried and left his children. Amongst all the casualties, Aquib Gulzar, 20, was the first. Son of Gulzar Ahmad Sheikh, he died on spot at 11.30 am after the shell exploded. Aquib had three brothers and three sisters, out of whom the elder brother is married and now lives separately. Aquib left his studies in 2016, and to run his family he used to sell seasonal things on a cart. Kulgam town has turned into a desolate place, following the death Uzair Mushtaq, 12. A day before the encounter, the whole of Kulgam was in celebration mode following the Urs at a local shrine. But like every other person, Uzair’s family had no idea that the next day would turn into mayhem for them. Sitting in the centre of a room filled with female mourners, Uzair’s mother, Shafiqa Banu, 36, has turmeric pasted on her forehead. Wailing over the death of her son, her eyes have swollen and her voice sounds hoarse. Youngest of all the slain civilians, Uzair, son of Mushtaq Ahmad Dar, died of a ‘bullet or shell’ injury on his head. After having his breakfast on Sunday morning, Uzair took his Adhar card from his cousin sister and left the house. Instead of a direct route, he wanted to reach to the encounter site via an orchard, half a kilometre away from Laroo, where he got injured. Uzair with severe injuries over his face and head was picked by locals and taken to district hospital Kulgam. From there, doctors referred him to SMHS hospital where he succumbed to his injuries. His funeral was held at the compound of the shrine of Mir Syed Simnani. People carry body of one of the seven civilians killed in an explosion, inside a hospital in Srinagar. Mushtaq, Uzair’s father, was busy harvesting paddy with no contact with his family. He carried a phone but the services were shut. When he returned home for lunch, his wife, Shafiqa, informed him that their son was not home since morning. Mushtaq heard that many of his neighbours were injured at the encounter site so he rushed to the hospital. At the hospital, Dar saw Uzair’s friend injured and as he went out to get an injection for him, he saw his other neighbours taking his son to the Srinagar hospital. “Had I been at home, I would have never allowed him to leave the house that day,” Mushtaq said, as a sob constricted his throat, cutting off his words. Being the only son among daughters in the family of his three uncles, Uzair’s every sister cries for him. “We have only daughters in our family, and Uzair was our only son. We have another son but he is not mentally well,” his uncle Rashid said. “We three brothers had all of our hopes tied with Uzair.” In a recent video shared on social networking sites, Uzair’s younger sister, Tanzeela, 10, has uploaded an emotional video on the Youtube in which she sings an old folklore in Uzair’s memory. Late Sunday evening, one more name was added to the list of slain civilians. In grief-stricken Hawoora that falls in Khudwani belt, people have once again gathered to mourn the death of Javiad Ahmad Lone. “It has become a routine now,” Mohammad Hussain, Javaid’s neighbour, said. “Every now and then, this village sees blood.” Javaid was also injured at the encounter site. He was referred from Kulgam district hospital to SKIMS, where he breathed his last. Javaid is survived by four brothers, five sisters and his aged parents.